It was already the time that vegetation laid asleep when Kusla slowly walked up the stairs and returned to the bedroom, truding his tipsy legs. After letting Fenesis sleep in the bedroom on the first floor, he had been discussing with Wayland in front of the furnace, at the bottom of the workshop. They had met the worst form of interference in the worst possible moment. It was really impossible to think Post would have leaked some information to the Prayer people, so they would have view it as a coincidence. But it was because of this reason that there was something troubling. If she had come with malice, there was still room for negotiation. The Prayer Group must have been feeling anxious, as they were unable to grasp where Thomas left his records. If they wanted to use more violent means, there was a huge lump called Post in the way, but there was no decisive information for them to use such forceful means. If they were to attack the workshop through brute force, and not gain anything as a result, who knew what sort of retaliation would happen to them. Even so, Kusla’s group only had the duplicates of the 2 parchments Thomas left behind. If they did not experiment in refining pyrite, there was no way they could decipher it, and unable to know what vile act did Thomas do exactly. And so, just when they decided to experiment in the night, Fenesis came. If they were to use the water wheel to move the vents, they would certainly be noticed. There was a limit to how much they could hide, for since she foolhardily described how happy she was when she was distilling zinc and got scolded for it, it seemed she would directly report this as well. Of course, if they wanted to continue Thomas’ experiments, there was also the option of waiting for it to cool. But Kusla’s group knew that Post might the the reason for their downfall, for he might be viewing them as an eyesore. Though he might not send in assassins to kill them like what the Choir would do, but he would distance himself from this workshop. In that case, there would be no guarantee the duplicates could be safely transferred out. Considering Post’s extremely prudent personality, there was no way they could underestimate this possibility. And this was ever so constant in this situation. Because of this, Kusla and Wayland were racking their heads. Thomas’ great accomplishment could not be hidden in the darkness of history because of a trivial reason like defying against religious belief. Let alone be buried by a model student-like decision, to take care of the other alchemists. Upon thinking about this, Kusla’s group felt that they could not allow this to happen. It did not matter even if nobody else cared about it; the pride of an Alchemist demanded different. Then, there was only one choice left. Wayland must have seen this only path left as he glanced aside at Kusla, and suddenly said. —Let’s do it when it’s time~ It’s the best method to shut someone up. Kusla knew he would have come to this conclusion soon, and took the wine. —Since she’s so lonely, you might as well do it rather than let her continue on like this~. Wayland had said this with a frivolous tone. Do you want me to take over? It was probably Wayland’s expression of concern that he did not say this, but he certainly was sharp enough to immediately sense that Kusla was especially concerned about Fenesis. But once he got out of the living room and owned the door leading to the bedroom, his frown intensified. He had already told Fenesis to go to sleep, but the latter was curled at the wall, ostensibly stating that this was how she had lived up till this point, that it was something she was most accustomed to. However, the weather was excessively frigid, and nobody, other than the travelers used to such conditions, could sleep on such a cold floor. In fact, one could tell Fenesis’ body was trembling cold even in the darkness. He returned to the living room, boiled some water, lit a candle, and returned to the bedroom. Fenesis lifted her head in the face of such words, her body all unable to move as it was ostensibly frozen solid. Both of them had their backs leaning on the bedroom wall as they remained under the blanket. The reason why they did so was because the wall was connected to the furnace shaft, which made the wall warm. The reason why they were under a blanket was because Fenesis was trembling so hard she resembled a victim caught in an avalanche. And as Kusla had just drank some liquor, he was worried that something bad would happen. Thus, he brewed some tea. After a little while, with the help of the blanket, warm wall, and tea, there was some snorting from the nose, which had warmed up like melted ice. There were all sorts of hidden meanings in these words, but Fenesis did not answer immediately. In fact, nobody would want to hear this from an Alchemist devoting his entire life into Magdala. Kusla pointed at the bed, and Fenesis followed his line of sight, before lowering her head deectedly. Once he placed the hand on the shoulder, her petite body cringed. Any form of food, when heated, would soften and let out an aroma. Fenesis’ body had loosened a lot as compared to when she was frozen solid a little while ago, and there was a sweet aroma from nowhere. Most probably, her body was probably covered with the Frankincense the Clergymen had used for prayer. Fenesis kept her head lowered, and did not answer. Fenesis then brought her small mouth to him, and his smile froze. No, this isn’t it. Kusla thought. Had she given up? Is she confused? She ostensibly had all sorts of other emotions, and yet did not seem to have any; it was an expression seemingly filled of emotions, and seemingly devoid of emotions. Fenesis had already made up her mind, unlike the perplexed Kusla. He instinctively withdrew his hand from the chin, and slowly lowered his chin. And then, *Kok*, her cheek was resting on his shoulder. Fenesis said as she leaned her body towards him like a lover. But the way she answered, her breathing, her lifeless movement resembled more like a corpse whose heart had just stopped beating. Actually, Kusla did not know whether they had said it to such an extent. However, one could imagine the exasperated superiors actually thinking it did not matter to them even if it came down to this. It was akin to a Badger Game; doing anything to a Sister alone would be deemed a sin in this world. After which, they would thoroughly investigate the workshop and achieve their aim. However, they had already sent a girl to a workshop with two men working there. As expected, Fenesis did not respond to Kusla’s words. Her petite body and head probably had yet to comprehend what she was doing at this point after all. Kusla retracted his hand that was placed on Fenesis’ shoulder. But at that exact moment, Fenesis’ hand grabbed onto his. It was ostensibly a voice heard from the grave when burying a body in a cemetery. Kusla however let out a smile. Her face, shrouded in darkness, was ostensibly a corpse sullied by the dirt in the grave. Kusla state at those eyes seemingly yearning for separation, and looked aside slightly. This was not uncommon, and certainly not the first time he was seeing someone face his doom. Life and death was simply just an issue is whether the heart remained breathing or not. There were many various ways to die. For example, an Alchemist giving up his quest for Magdala, or a Sister selling her own body. Kusla finally let out a wry smile as he shrugged, and Fenesis confined to state at him intently. She again brought her cheek to his shoulder, like a love couple sharing their pillow talk. 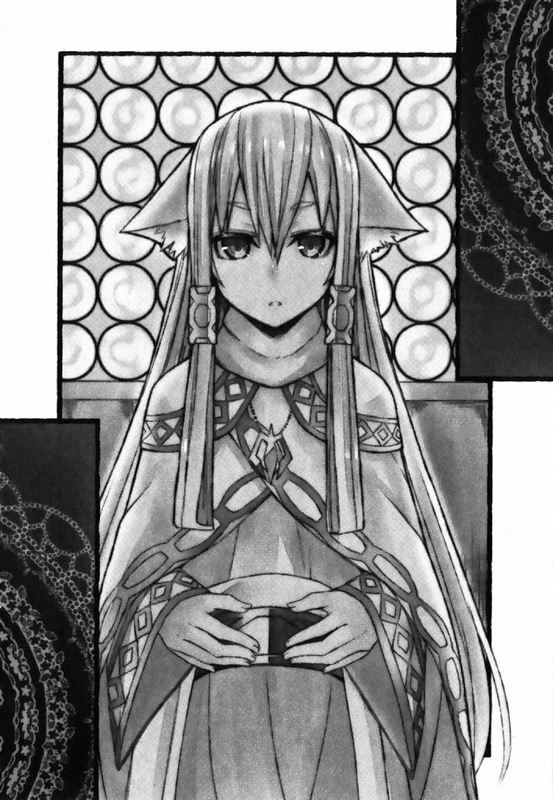 Of course, just as how Kusla felt a sense of familiarity from seeing Fenesis’ reliance on the Choir, so the later might have the same feelings. Thus, Kuala tried his best to talk with a candid tone as he said half-jokingly. Kusla said this without hesitation, and sounded a little shrill, for the more important the term was, the harder it would be to say it. Kusla had decided that no matter what Fenesis replied, he would remain silent all the same. For this was a forbidden dream even for an Alchemist. No, it was precisely because he was an Alchemist that it was forbidden. Was this something one thinks is worth risking his life on? For this was a dreamy statement any adult with a mind would widen his eyes and shake his head at. Fenesis continued to listen without saying anything, her body remaining unmoved. The hand held by Fenesis twitched slightly, and grabbed the hand grabbing it. It was an utterly ridiculous topic, but he did not want it to be deemed as a lie or to befuddle others. For some reason, Kusla suddenly had a notion, that if the person holding his hand were to say it, it would sound realistic and honest. “I want to create Orichalcum. What followed was a world where he could speak his true thoughts, without hiding anything, and he cringed slightly. But he was holding Fenesis’ hand, and the latter was not holding his. He wanted to convey something through this hand. She lifted her face at him. Her eyes resembled those of a cat’s, extremely clear as it strolled under the moonlight. He suddenly had an excuse to explain himself, that it would be fine to reveal his thoughts to this witch’s Familiar of a cat. Fenesis remained silent, showing a slight smile. She seemingly found someone similar to herself. When a person bet everything for something, he seemed a babbling fool to a bystander. She did not know whether to laugh or be impressed by him, but her flabbergasted human expression was certainly unique. However, Kusla felt a lot more relaxed when seeing her face. The reason why he had this dream was that he witnessed his village get burned to the ground. The girl he was holding hands with a day ago when they went for the hill later became a casualty of arrows. He only had a single belief in his heart, that is to get the power to protect everything. But in this world, where one’s personal strength was vastly helpless in itself, just thinking about it alone was an utterly ridiculous notion. But even so, Fenesis smiled with a slight bitterness. She seemed to be implying that she was the same. It was not a simile. Spies would typically hide a secret in a certain part of their bodies. They were Stalwarts, hiding their secrets in their gut, intestines, or even their flesh, and sew it up in practically every single part of their body. At that time, Kusla stood at the door, drinking away as he watched the ‘Masterpiece’ on the floor. 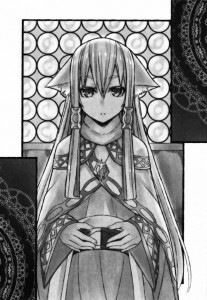 Fenesis listened to Kusla slightly, her expression not changing at all. Kusla’s master had christened him as Kusla for how inhuman he was, and Wayland had compared him to a clock that continued to tick. Kusla too was aware about this, but did not understand why he was still passionately chasing after the Land of Magdala. That was why he felt he was a fool, that he could not stop despite knowing this, that he was the same as those who indulged in alcohol and gambling. His faults would probably persist till the end, or that he could persist on till this point for he knew he was such a fool. It was a feeling of dealing with things when they came. Alchemists all had such a feeling, probably because they all had this something in their hearts. You are a fool, they would think, but would respect the Magdala others had, for they understood the pain each person had. Kusla felt this was the reason why Thomas’ metallurgical records should never see the light of day. Thus, when he heard those words from Fenesis, all he could show was a smile completely beyond fury. There was merely a pitying expression. Was she trying to say he was incorrigibly beyond hope? That was what Kusla personally thought too. But there were some words he could not pretend not to hear. Fenesis’ chest was grabbed at tightly. This action was near instantaneous, so this, and what happened afterwards, happened in a split instance. But because it happened in an instant, he noticed Fenesis’ expression. He grabbed her by her clothes, but she did not show any surprise or fear. It was a calm smile, a relaxing one. A fool who had a nonexistent place as a goal. Kusla continued to stare at Fenesis intently. But the latter stared back at Kusla, showing a troubled smile. She let out a mutter. Kusla did not talk back, for he did not understand what Fenesis said at all. And more perplexing was why she could remain so calm. She placed her hand on Kusla’s hand that was grabbing onto her chest. Kusla did not think of letting go of the hand grabbing onto the chest. It seemed there was a huge misunderstanding. He should be angry here. That was what Kusla told himself, but his body did not move. Perhaps he was subconsciously expectant of the words that were to follow. Fenesis let out a wry smile. That was the expression of a girl who just heard someone brag about his lover. Kusla felt his heart being shaken at its core. He had difficulty breathing, he felt his nose was about to bleed, and he instinctively brought his face to his hands. He was suddenly overcome with sadness. The slighted truth changed everything. Kusla witnessed the memory of lead become that of gold. At that time, he was not a cold-blooded man thinking about metallurgy, but thinking of how he should have protected her. The fact was he was feeling sadness, confused, but they were cast behind, that he should have gotten Orichalcum, which would have protected someone important, like Friche. He was merely troubled by his own rational thoughts. It was not that he did not value others. But that he did not notice. Kusla was ostensibly swimming in the torrent of emotions, and yet wading in reality because of Fenesis’ words. His mind was only filled with confusion. Why would Fenesis smile like she was relieved? What in his words caused her to feel this way? Or was Fenesis really such a gentle Sister? But more than that, there was the instinct of an Alchemist whispering at his ear. Was he not notified of something important? Like some magic ingredient he did not know of into the cauldron of metallurgy, turning lead into gold. And why exactly did Fenesis come here? She definitely was not here to heal Kusla’s emotional wound. Or rather, perhaps she came here, seeking death? The retracting hand was stopped. Kusla, in his attempt to flee, was caught. Fenesis was the one pursuing him. Kusla let go of Fenesis’ hand. She, was was beside him, went from being a kitten seeking warmth to a serpent seeking its prey. Kusla placed his hand on the shortsword hilt. Fenesis tilted her head slightly, and smiled. What sort of magic would be required for this? Kusla really could not think of anything. It would be too late to use a Honeytrap tactic, and he was certainly not a fool who would be fooled at whim. Moreover, it would be all the more impossible to use violence. Poison? Assassination? Or an ally making a hit? None of them seemed plausible, and Kusla hesitated in his actions. And so, in that short moment, Fenesis executed that magic clearly. He let go of his shortsword. Not because of the magic affecting him, but that he let go of it due to excessive shock, as the hilt in his hand slipped off the sheath. But even so, he understood everything. He understood once he saw Fenesis remove her veil. She came from the Far East, from a cursed tribe, saved by the Knights, and was escorted back cautiously. However, she was placed in a monastery under the Knights’ charge; a laughable story akin to a ragged doll being tossed about. But this caused everything to come to light. Kusla was certainly driven to despair. Was the appearance of the Devil recorded in the Holy Manuscripts. The most despised sin amongst the 7 Great Sins. Her snowy white hair was prettier than anything else. But there was a reason why it was deemed as ugly. There were many rumored instances of humans mating with beasts. But there were also possibilities of that. It seems, from the bloodlines, that such people really existed. Fenesis said with an emotionless expression as she pinched lightly at her ears. A being not as a human, but as a beast. That is. She looked really cute as she said that, tilting her head as she smiled. But at the same time, one felt a sense of fear, for that were a near fanatical obstination in there. Fenesis continued to tilt her head with a smiling face. If you dare to do so, that is, if those words had been said, the shortsword in Kusla’s hand would have probably flown out. The reason why she did not do so was because she still remembered being threatened by Wayland. She was not a fanatic who did not care about her life. Even so, her lips were shuddering slightly. She certainly was looking troubled, and there were signs of it on her smiling face. What should I do? She was completely hapless in this aspect. The smile was slowly fading from Fenesis’ face. Her face then showed no signs of emotions, and she probably felt the same as when Kusla grabbed her hand. That was when they were refining zinc. At that time, Fenesis was really at a loss of what to do. And then, she grabbed his hand delightedly. Sometimes, people could handle several cruel instances calmly if they did not know the truth. At that time, it could not be helped that he did not know. But at this point, Kusla knew. He had a lot of information that would allow Fenesis to fulfill her dream. If he were to tell her that there was information of the Choir’s pursuit in Thomas’ Metallurgical records, her dream would be fulfilled. But at the same time, he would be betraying Post, and many other Alchemists in the process. If he did so, his position as an Alchemist working for the Knights would no longer exist, let alone his existence on this world. If there was, he would simply be affiliated to the Choir, living as a Clergyman of sorts. Either way, he would have to give up on Magdala, and in that sense, he had died. Fenesis’ words were without pretense; Kusla was certainly cornered into despair. Her existence was a sin itself, an impure existence that would cause those related to her to be deemed as Heretics, those who turned their backs on God. It was not simply an empty term ‘cursed’. Those that had interacted with her, talked with her, lived with her, would all be prosecuted by the Church without hesitation, and this was probably the same in the Far East. Anyone who had seen her identity would only be killed, and others who had seen her could only kill her. They could only kill her and bury her. That was the only way to save the witness. Alchemists were at most frowned upon by others, but even so, Kusla knew how much pressure it was for an Alchemist to live on this world. If he had not joined the Knights, he would not be able to live on; this would be the same for Fenesis. If she were persecuted by the Knights, she would be hapless. Fenesis was the one pushing Kusla to the brink of despair, and the blanket resting on her shoulder soon slipped off, and weakly landed on the floor. Once she took off her veil, her unkempt long hair was scattered massively on the floor. Her slender shoulders matched her body, and she resembled a melting block of clay. At this point, she looked unstable, ready to melt away and vanish without a trace. The green eyes showed no signs of despair, for she had the pessimistic view that no matter what happened, there was nothing worse than this. In contrast however, those eyes were looking forlorn, hapless. Her eyes were ostensibly asking, What do I do? Are you willing to die for me, or are you going to kill me? This was what those lethargic eyes of hers were saying. Kusla tightened his grip on the shortsword hilt, and Fenesis sensed those movements. Her beast ears were twitching anxiously, like a real cat. There was no one not fearful of death, let alone the descendant of a cursed tribe. But once the tip of Kusla’s shortsword was pointed at the throat, Fenesis’ lips showed a forced smile despite them still trembling. Did not swing the shortsword down. Kusla stared at the blade of the self-made shortsword he was proud of, and blew aside the dust resting on it. At least that is what I think, Kusla kept his shortsword as he said. Kusla looked disinterested as he averted his eyes and kept his shortsword, while Fenesis stared at him blankly. Even if you say so, what can you do here? An Alchemist had said this before, that it was impossible to turn lead into gold. So what can you do at this point? Fenesis first showed an expression of incomprehension, and then nodded tentatively. She continued to give a dumbfounded look as she stared at the wry-looking Kusla. She looked as if she just woke up in the morning, dazed looking. Once she was teased, Fenesis finally showed a trace of emotion on her face. She tugged hard at the veil in her hand, and bit her lips hard. Kusla quickly turned around, and squatted in front of Fenesis. The latter cringed her shoulders in fear, and curled up. Her eyes were filled with fear, and emotions. This kitten did not want to die off so plainly, and was prepared to die just so she could live. Kusla lifted his head, and looked towards the door. The layout of this workshop was carefully planned, as one would expect of the highly skilled Alchemist Thomas. No matter who attacked here, they would have to come from the door, through the widest path. She really was an honest child. Kusla chuckled, his nose ostensibly itching. Fenesis’ body froze, ostensibly unable to breathe. Kusla twisted some of Fenesis’ white hair, and let it down again. Normally, nobody, upon picking up this silk-like hair, would think that it was part of the body. Fenesis continued to stare at Kusla without blinking as the latter continued. Kusla did not look at her. But he placed the blanket that had slipped off Fenesis back onto the shoulder. Kusla smirked, and finally met Fenesis in the eyes. The latter had such beautiful eyes. A cloth dyed black would never be turned white again. Fenesis merely grabbed Kusla’s hand as the latter was about to reach for the blanket on her chest, and cover it over her. The way Kusla responded and grabbed her hands was such that they seemed to be in a dance, their palms meeting each other. “There’s nothing decent in the world. I guess you’re told what signal you’re supposed to release, right? It was unknown if it was this vulgar usage of terms that caused her to frown, or if it was something else. But she turned her face aside, and wanted to move her hands away from Kusla. Fenesis gave up on letting go of the hand, and held onto his hand tightly. She tentatively leaned her body over, ostensibly trying to hide her pretty face from below. There was nothing for her to stake her courage on. A reason to run away, for she had something to protect. The reason why Kusla grinned was that, had he had not invited her in such a callous manner, he would have felt embarrassed. Kusla let go of the hand, and proceeded to embrace her. Her petite, slender body felt ready to snap if he had exerted just a little strength. Fenesis, upon hearing Kusla’s whisper, squirmed while ostensibly trying to break away from his arms as she looked up at him. Her face looked as if she was ready to cry anytime, utterly filled with confusion. He said as he brought his nose to her neck, sniffing at it without much concern. It was a sweet scent, numbing a nose that had been used to sulfur and ash. After a kiss on the collarbone, her body jumped up. She was a little girl who would get furious after a little teasing, and that nobody would get bored of. A thoroughly blushing Fenesis finally used both hands to push at Kusla’s face and seperate them. This would probably happen if he was hugging a real cat. He found this really amusing. Fenesis gave a confused expression, a mix of whether to be surprised or furious as she adjusted her clothing. The reproaching look on her face did not seem to be merely targeted at Kusla’s prank only. Do you even have to say this? Her expression was practically screaming that. Kusla was slightly taken aback by that serious expression, and reached his hand over, ostensibly wanting to comfort her. Kusla had no idea as to why Fenesis was so furious. Kusla tried his best to deny this thought. He could firmly believe it, rather than feel a mere terror from it. Once he noticed something, there was a shudder in his heart. He stared at Fenesis, and the latter stopped her movements. Fenesis, who was like a dead person obsessed with living just a while ago, reverted back to being that easily teased girl. The only thing different however was that her eyes were half-opened as she stared at Kusla, looking a little shy. Post was the one who killed Thomas? A denial appeared in Kusla’s heart. There was no reason for him to kill Thomas, for the latter and the other Alchemists were the most important existences to them. They, if measured in monetary values, It would be a staggering fortune. Kusla stared at Fenesis’ eyes, and as expected, her eyes were still narrowed. He felt that was similar to looking at a cat directly in the eyes. But she did not turn her head around. This would be the crucial moment to see what was boiling in the cauldron of alchemy. He wanted to have God’s forgiveness. This line caused Kusla to gasp. But Post realized this beforehand, and Thomas was eliminated first. But in that case, there was a problem. Fenesis was requested to investigate Post, but that alone was not enough to justify her behavior. It was a case of overreacting, using her just to achieve this aim. The expression was akin to that of an inquisitor. Just confess already. Or you are going to Hell. That expression was basically crying this. Kusla looked up at the ears. He recalled what happened in the morning, where she was sitting in the courtyard back then. A human’s ears could not hear, but what about beast-shaped ears? He looked as if he had dug his own grave, once he realized that when he was confessing his true thoughts after getting drunk, Fenesis was with him. They would kill Fenesis, and then use her to extort goods the Choir; Kusla’s group would naturally be killed too, for they knew about this. Logically, this was very plausible. Kusla used his hand to stop Fenesis from muttering to herself any further. What she said was valid. But Post’s words could be extremely valid as well. The reason why Fenesis did not speak up was simply because she did not manage to keep up. But there was no time to explain to her. Both sides had different reasonings, but they were both valid. It was not out of mere coincidence that this could happen. Then, there had to be a lie hidden in this, an ingenious one at that. Both the Alchemists and Fenesis were existences that could not live once they leave the Knights’ protection. If they want to continue living on peacefully, they would have to seek protection. And at this moment, once they choose the wrong side, someone would die, or worse, both sides would. Whether to choose the Choir, or the Baggage Corps. What exactly did Thomas know? What sort of information did he leave behind? What did this line mean exactly? Kusla held Fenesis by the held and stood up. But no matter how he tugged at her, she just would not move, and she even instinctively withdrew her hand from Kusla. 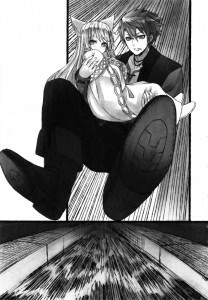 She placed her hands in front of her chest, ostensibly instinctively protecting them, as they had been held earlier. She was staring at Kusla timidly, but could not continue. Fenesis again stood at the crossroads. Is there anyone else on this world more worthy of being protected? 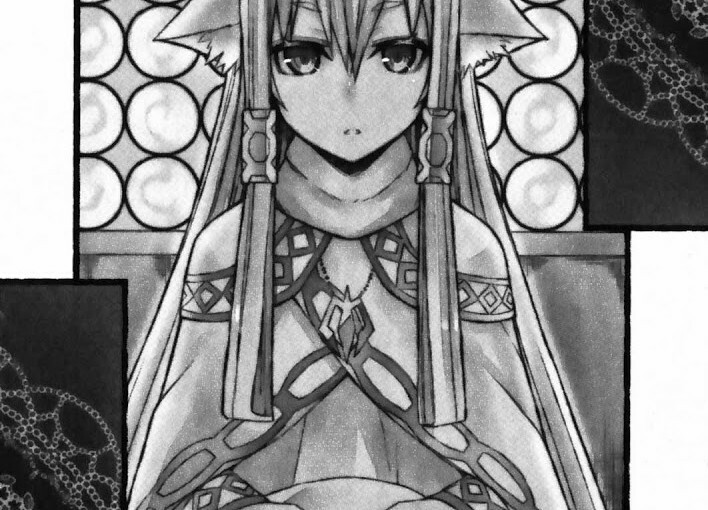 This girl bore an absolute cursed fate, and though the beast ears looked that intriguing, but after seeing the strange symbols on the constellations, he found those ears a little cute. And more importantly, he firmly believed that if there was a sword of Orichalcum along with her, there would be nothing more perfect than that. Kusla reached his hand out, but the latter winced as she looked down. He stopped his hand that was reached out, and sighed. Kusla nearly bared his teeth as he laughed, but she was rather serious. She fidgeted about as she put on her veil, and stood up. Fenesis nodded, and followed Kusla out of the room. Just when she was about to head downstairs however, she stopped. Kusla said, but Fenesis was already running off. This was not a joke; it someone were to lie, it would mean they had to move quickly. And Post certainly would have known that Fenesis was at the workshop in the middle of the night. In that case, there would truly be no time to hesitate. Once they get killed by an incoming group, they would not have a chance to think of anything. With an anxious heart, he returned to the bedroom. He saw Fenesis holding her luggage in her left hand, and something strange on her right. Fenesis lowered her head with an angry look on her face, and scampered behind with her head tucked in. She was holding a silver Holy Mother statuette. Kusla inadvertently stopped in his tracks and started at Fenesis in surprise. She was biting her lips and looking aside, probably shy or something. I guess she’s doing this on purpose. He wondered. He did not feel at ease upon knowing that she treasured something he randomly picked for her carelessly. Kusla swiped the statuette from Fenesis’ hands, and then proceeded to play with it in his hands. If one were to think about it, this was also a misconduct of hoarding money. If what the Choir said was correct, perhaps this was a more severe sin. Kusla grimaced as his lips curled upwards, while Fenesis snatched the statuette from his hands. And then, she started rubbing the Mother statuette with her robes. Kusla states at her blankly, and it was not because that silver would remain this dull no matter how she rubbed. But because of something basic. Will putting the Holy Mother statuette into the fire really warrant Divine Punishment? Kuala widened his eyes, and again snatched the statuette away from her arms. He ignored her protests behind him as he hurried down the stairs. He arrived at the second basement, and Wayland, who was awakened by the footsteps, was showing a displeased look after being suddenly hit with a fire iron. Kusla tossed the Mother statuette. Wayland caught it perfectly in the darkness, and stared at it perplexedly. The statuette bobbled side to side in Wayland’s hands. Kusla had firm belief that Wayland’s senses were as sharp as a wild beast. Wayland asked back thoughtlessly, and once he threw the Mother statuette back, Fenesis came by late, and crashed into Kusla from behind. What followed was the sound of the door being broken down. Wayland immediately raised his leg, reached his arm out to grab something, and sprinted like an escaping hare. This was probably something made of pure gold, which Thomas had left behind, and as he was used to being attacked, his first instinct would be to take all the valuable items with him. Kusla too wanted to follow suit, but there was something more important than money. He grabbed her, cradled her in his arms while she showed a crying expression, and tucked her under his armpit. During this time, he grabbed Thomas’ metallurgical records and the Mother statuette scattered on the table. Angry growls could be heard from above. She said as she was tucked within his arm, but this was not an expression of weakness. For she had been attacked so many times, and her parents and tribesmen were all killed. Kusla deliberately said this optimistically to calm her down. But if looked together with that Mother statuette and Thomas’ records, there seemed to be a vile presence to him. Alchemists would give up everything for Magdala. And those who dared to sully it were not to be forgiven. Kusla murmured, ostensibly cursing as he chased up to Wayland. The latter was carrying the equipment regulating the waterwheel, and opened the dam that was obstructing the water flow. Wayland said these words before disappearing. Kusla walked out of the house, breathing white air, and stared at Fenesis in his hands. And Kusla did not hear her reply as he leapt into the water current flowing down the cliff. There was something called a watershed. With that place as the target, all blacks and white were everchanging. The current of time was icy, cruel, more so than a water current. Once one proceeded forward, there was no turning back, and no stopping. Countless people would be driven by it, and even those that managed to ‘swim’ during their time in the current would ultimately die of weariness. There were only a handful that could remain steadfast, tireless without sinking, and make their way to the golden ocean. The Alchemists called that ocean Magdala. That was the only unchanging goal amidst the countless parting decisions they made one after another. There was only silence in that scene. And the icy sound of water dripping. What met this line that was finally eked out from the throat, was the sound of a collapse. It was the sound of Kusla, who just got up from the water, collapsing. Post’s bulging belly was preventing him from standing up. Post called out to the other side of the door with a louder voice. Naturally, the reason why there was still someone waiting in the office was because there was news of the commotion in the workshop. He knew the people from the Choir would have attacked the workshop, and sent people for lookout. The subordinates, who had hurried down from the corridor was taken aback upon seeing Kusla. The latter was clutching at his chest, looking over with a wincing expression. He jumped into the canal, in the midst of the frigid cold, where even the breath would turn white, ducked through a few impellers of the water wheels, escaped from his pursuers, and arrived at this place. The subordinates hurriedly nod in response to Post’s growl, and darted to the corridor. Kusla continued to clutch his chest as he used his other hand to stand up. Upon seeing this, Post frowned and shook his head. He slammed his fist on his desk. Kusla leaned his back in the wall, and faced Post whilst breathing out white smoke. Post hollered for a little while, only to suddenly calm down, rub his eyes, and mutter. The Choir was aiming for Thomas’ metallurgical records, and had planned to swoop the Alchemists from the Knights as well. It would be very troublesome if both Fenesis and Wayland were caught. Kusla widened his eyes in surprise. The workshop Thomas left behind was burned…a workshop an Alchemist had staked his life on when he built it was burned into ashes. He shuddered, not because of the cold, but in fury. Kusla too stared back through his dripping bangs. Post widened his mouth, and then rolled over the table. His large hand was grabbing Kusla’s shoulder, and he lifted the latter. He was ostensibly about to choke Kusla. Kusla thought about how Thomas’ workshop was turned to dust, and the regret caused him to nearly break down in tears. Upon hearing Kusla’s words, Post turned around, and staggered backwards. Post stumbled backwards, took a deep breath, and stretched his back. He rushed to the wall in an unexpectedly agile motion for a man of his size. Post grabbed something that let out a metallic sound, and turned around. He stabbed a fire iron into Post’s hand as the latter turned around, and pressed the latter into the cabinet with excessive force. Kusla said, took out a tool hidden in his chest pocket, and slammed it on Post’s leg. It was a sharp metal rod, attached with a long nail that was as thick as an adult’s finger. Kusla then took out a hammer and smashed it into the toes of the other leg. Post was unable to support his body, and tumbled onto the floor, his pierced arm being the only thing raised awkwardly. He threw the hammer aside, and took out the shortsword at his waist. Some people had arrived on the corridor, and Kusla glanced at them. These people had came all the way to this town in their mission to hunt Post down. They should have been used to bloodshed, but upon seeing such a scene, gasped. One could even seen them falter. Perhaps his expression at that point was really that terrifying. Kusla ignore them, and turned back to Post. Kusla blew on the blade that was colder than the frigid night, and narrowed his eyes ait it. The blurred surface quickly cleaned up; it was a fine metal, but ways to go from Orichalcum. Post was sweating as he panted hard, staring at Kusla, and had no intention of answering back. Kusla looked on coldly, thinking that it did not matter. This man had crossed countless battlefields as a member of the Knights, and finally made it to this position. It was hard to imagine he would personally speak up. Did that Thomas want to put the Mother statuettes in the fire? The silver goods were practically filled with impurities, and at this point, if the Knights had claimed it was pure silver when they sold it, they could save the hassle of refining. But would this enrage God? As a precaution, Thomas mentioned this to a member of the Choir, but unfortunately, Thomas learned about it. The Choir’s men were secretly investigating Post, but Thomas did not know Post was using the Mother statuettes to build his wealth, and let down his guard. In the end, he was assassinated. He fell into a trap and was killed, just because he did not know something. This was the path Alchemists walked. But even though they knew there was this path, they had to continue on to their goal, Magdala. Post’s beady eyes spotted the movement of the sword being held in a reverse grip. May Your Soul Rest in Magdala. Kusla swung the shortsword down.